Rachel Tiller, WP2 leader and Senior Researcher at SINTEF Ocean – Section for Governance, Climate and Security – has been awarded the prestigious Fulbright Arctic Chair scholarship for 2018/2019. The title of the project is: “Evaluating the BBNJ treaty as a global political solution to plastic pollution in areas beyond national jurisdiction, with a special focus on the Arctic Ocean”. This work is in line with the REGIMES objectives, in that the results will provide much needed insight into the critical question: To what extent is the Central Arctic geopolitically ready for new climatic realities? 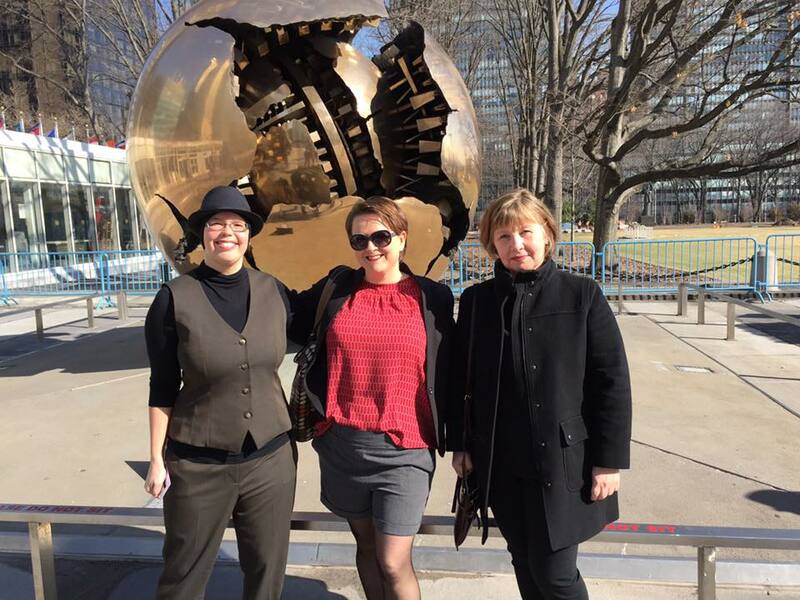 Elizabeth Nyman (left), Rachel Tiller (middle) and Aslaug Asgeirsdottir (right) outside the UN building prior to the BBNJ forum meeting in February 2017. Tiller is hosted by Texas A&M University at Galveston, which is located right outside Houston, Texas, and she will be working closely with Scientific Advisor to the REGIMES project Professor Elizabeth Nyman, who not only leads the Maritime Studies section at Texas A&M at Galveston, but also is an expert in international maritime issues. She is furthermore particularly interested in oceanic resources, such as fish or offshore oil and gas, and how those impact state desires to control ocean spaces. She is highly respected in her field, and has published significantly. In addition, she is an expert on the BBNJ process at the United Nations and a natural collaborator on this project. Given that the negotiations take place at the UN headquarters, the US is a natural residence, especially in 2018-2019 when we expect the negotiations will commence. Though the location is Texas, far removed from the Arctic, the relevant field of expertise are located at Texas A&M at Galveston Maritime Studies program. The program is interdisciplinary with a focus on Maritime Studies, which in itself merits a visit. The Fulbright Arctic Chair is one of the Fulbright Distinguished Chairs programs; these awards are among the most prestigious appointments in the Fulbright Scholarship Program. The Arctic Chair is expected to do research and teach within areas that are relevant to understanding of the Arctic and High North regions. As Chair, Dr. Tiller is expected to engage with faculty inside and outside of Texas A&M at Galveston, give public lectures and lead seminars, as well as supervise and mentor Master’s and Ph.D. candidates with their research and writing. In addition to being a prestigious academic exchange program, the Fulbright Program is also designed to expand and strengthen relationships between the people of Norway and the United States and to promote international understanding and cooperation. Last years awardee was Professor in Physics Kjellmar Oksavik from the University of Bergen, with a project entitled “Evaluating the Temporal/Spatial Evolution of Plasma Flow Channels in Upper Polar Ionosphere”. The 2016/2017 Arctic Chair was Erling Moxness from the University of Bergen as well. The 2015/2016 Arctic Chair was Kjetil Vaage, who incidentally also was from the University of Bergen.